Kieran Harrod Design | Frozen Party Invites and other Frozen Party Bits! Outnumbered as I am 3:1 by ladies in the family, I do on occasion turn my design talents to some more girly design tasks. Our eldest, obsessed as she is with the endlessly successful Disney film Frozen, chose this as the theme for her recent Birthday party. No for reasons of both pride and tightfistedness, I always attempt to put together the little one’s birthday invites and other bits and bobs. When the time came I was super hectic so suggested we just grab something off of the web and I fettle it up to suit. However, search terms such as “frozen party invite template” and the like turn up a disproportionate amount of results, many of them “frozen party printables” available, at a fee, to download. There are one or two low res options but after a good while searching, I decided I could spend the same time actually putting something together rather than scouring the web. 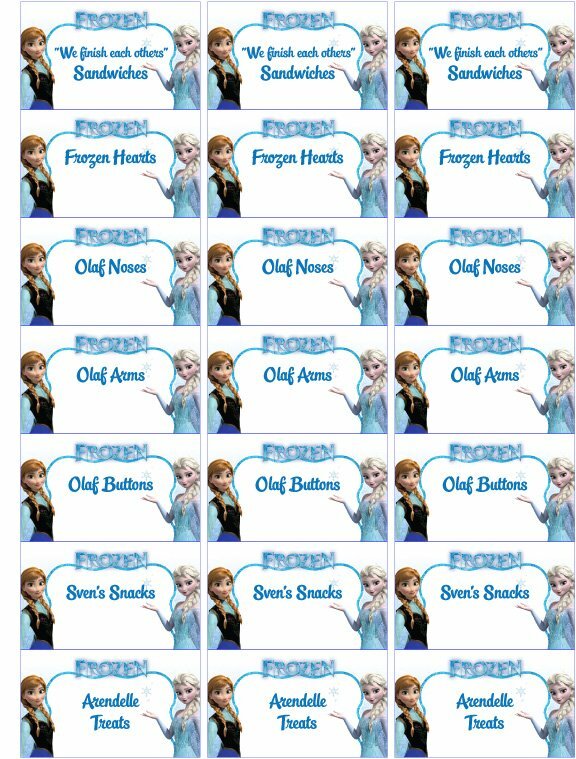 So I did, and in an effort to save you a job, I’ve turned my Frozen Invites into printable blank frozen invites and made them available online, for free. No sign-up, all high res. All it’ll cost is a Tweet or share on Facebook! In the package you get a blank frozen invite template, some frozen party food labels (to label the buffet with things like “Olaf Noses”, that can be used to label carrots or cheese puffs, “Frozen Hearts” for white chocolate dipped strawberries and my personal favourite “We finish each other’s Sandwiches” for, well, sandwiches), a second set of blank frozen name labels (both set to print on 21-up stickers) and a set of “melted snow” water bottle labels. You can share and grab the zipped frozen invites & more download and print them off to your heart’s content! There’s no catch or anything, they are released under a Creative Commons license (Attribution-NonCommercial-NoDerivatives 4.0 International (CC BY-NC-ND 4.0)), which basically means, grab the files, print them and use them, but don’t pinch them and sell them or otherwise pretend you made them. OK! That’s the small print, but honestly, all it takes is a share to grab’em, and use them, hopefully, they’ll save you scouring the web for something to use or save you a penny or two. If you’re after the font I’ve used, head over and snag StreetScript Redux from MyFonts. Free Frozen Party Invites by Kieran Harrod is licensed under a Creative Commons Attribution-NonCommercial-ShareAlike 4.0 International License. If you want a custom version of the invite, I’d be happy to oblige, use this £10 PayPal link and make sure your email address is correct, and I’ll get in touch as soon as possible to arrange the everything!